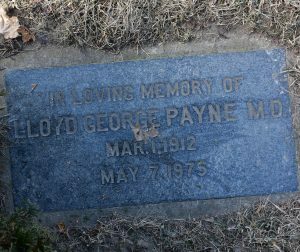 Dr. Lloyd George Payne was born in Port Lambton, Ontario on the 1st of March, 1912. His parents were Robert Payne and the former Alice Maude Mary Stenton. He had 2 brothers named Robert and Glen and he had 2 sisters named Evelyn and May. Dr. Payne was educated in one-room school house in Whitebread (S.S. #5 and then #16). He attended Wallaceburg High School from 1924 to 1929. Dr. Payne continued his education at the University of Western Ontario and graduated L.M.C.C. in 1935. Dr. Payne interned at Hamilton General Hospital between 1935-1937. 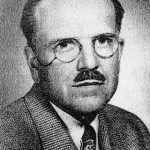 Dr. Payne started his family medical practice in Dresden in 1937. Dr. Payne married Dorothy Elizabeth Payne on the 6th of April, 1940 in Dresden. Mrs. Payne was born in Chicago, Illinois on the 27th of September, 1916 the daughter of Dr. William Henry Payne and the former Sigre Christen Wall. Her father specialized in eye, ear, nose and throat. Her father was born in Dresden and her mother had been born in Sweden. She had a younger sister named Frances. 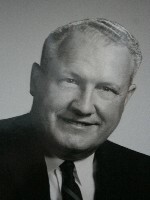 Dr. Payne was President of the Kent County Medical Society in 1952 and Chairman of the medical staff of the Public General Hospital, Chatham from 1962-1963. He represented the Kent Medical Branch of the Windsor Medical Society for 5 years. 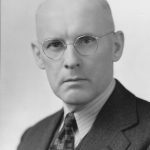 Dr. Payne was elected to Dresden’s Town Council in 1948. He served five years with the Dresden Public School Board, 3 years on the Lambton-Kent High School Board and he spent 15 years on the Dresden Public Library Board. Dr. Payne was associated to many factions of the Masonic Lodge. Dr. Payne enjoyed sailing, gardening and fishing and he was a member of the United Church. Dr. Payne died on the 7th of May, 1975. He left behind his wife Dorothy and 4 sons; Dr. William Payne, Dr. John Payne, Thomas Payne and Robert Payne. Mrs. Payne died on the 1st of November, 2001. Dr. and Mrs. Payne were buried at the Dresden Cemetery. *His son, Dr John Christopher Payne is also featured on the Chatham-Kent Physician Tribute website.